Welcome back to the intro course to playing piano by chords, ear and heart. Let’s dive into lesson 2. The layout of keyboard and how to easily find your way around. 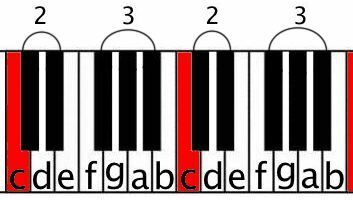 How a chord – multiple notes, works just like a word = multiple letters. Advantage of structure remembering, chunk learning. How chords are the skeleton, the foundation of music. The C chord and how full it sounds. Accompanying a song and making someone happy on their birthday. Since, as per indicated in the intro lesson, we’ll be learning piano without looking at sheets, we have to have some other way of knowing which notes to press, right? If you take a good look at the keyboard, you’ll see a recurring pattern of 2 and 3 black notes. That’s your visual (and/or touch-sense) indicator of where you are on the board and how you know which keys to press. Note that when I’d stick two of those chunks together, we’d get a larger part of the keyboard, however, note that it is in fact simply two of these same parts stuck together. When we’d add a few more, we’d get to a complete keyboard. Now, for example, when I indicate this note. It’s quite easy to determine that it’s situated on the left side of a group on two blacks. Which in fact makes it the same note. Not that you immediately have to remember how they’re all called, but just so I have some names to use when I want you to press a specific key (in stead of “the one in the middle of a group of three blacks,”) here’s the names of the white ones, the only ones we’ll be using for now. They’re quite conveniently named after the first few letters of the alphabet. As you might notice, as the stuck together chunks make the pattern of 2 & 3 blacks recur, so do the names of the notes. 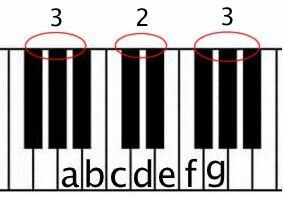 So as that one that you now see is called “c,” is in fact a “c” anywhere on the keyboard when we’re talking about a note that is to the left of a group of two blacks, this goes for all keys. 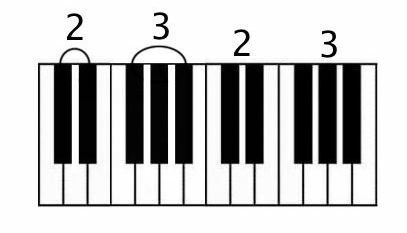 So to know the names of all the white keys, you only have to remember a “chunk” of 7 different notes, named after the 7 first letters of the alphabet (although when we chunk like this, you don’t start at the regular “a” but at “c” – after which comes “d,” “e,” etc. just like the regular alphabet). Makes it way less complicated looking all of a sudden, right? So next, let’s see what’s up with those “chords” that I was talking about. A “chord” is simply a few notes together – yes just like a word consist out of a few letters together. If you’re struggling with your fingers, don’t worry, this is a matter of getting used to, just like with any new skill it might feel a little shaky at the start but will start feeling normal real soon – try to stick to fingers that I tell you to use (even though it might feel strange or unnatural to you). Hear how full, rich and harmonically that sounds? Let’s make it even fuller, by giving the left hand the super easy task, of playing another “c,” one chunk lower than the one you’re playing with your right hand now. Now, as music always is kind of a movement, let’s try to play it a few times (say.. 4 times?) where the time in between the chords is -almost- the same every time. Now that’s what I call full. Tip: if you feel your version was less full, and want to make it sound as full as my version, I used that utmost right pedal (or if you have only one pedal, that’s the one). Just press it down with your foot, then start playing while keeping that pedal pressed down. Cool eh? Tip 2: Try and play along with just the audio. Having no visual guidance whatsoever will train you to start using your ears, the sense that is actually relevant when dealing with music. Chords, just like words, are the foundation of music. At the end of the last exercise, I also showed you a way of “pronouncing” them. There are tons of different ways to do this, making for the many different kinds of music. We already had a nice example of “chunking” that seemingly large diffuse set of keys that make up the keyboard, in nice chunks that now after only a few minutes allow you to find any white key that I’d tell you. Now let’s see how to effectively use the “chunkness” of chords, by learning our next chord. The chord that we played just now, started on the “c” and is therefore called the C chord. Starting on “g” we’re going to perform the exact same trick as we just did, and when I say same trick, take note of the visual form of the chord. With just these two “words,” we can already play the start of a quite famous tune, which will also exemplify the “founding” function of chords. This is even without adding the “pronunciation” we’ve just seen! Note that in that more difficult version I still ONLY played those same two chords! Just with a lot of different kinds of techniques (more “sophisticated” pronunciation). In the next lesson, we’ll get back to Happy Birthday in an easier version, I’ll teach you another new chord and how to use that to finish this tune in its whole, so you’ll already be able to surprise someone on his or her birthday! I hope this gives you a nice glimpse into how to build chords and use ’em like words to speak music and sound rich, full and good from the very start.